Travel is one of the world’s best teachers – revealing cultures, communities and traditions completely unlike your own while at the same time illuminating how connected we really are. That’s why we believe travel should make a positive impact, both on you and on the places you come to know as a traveler. What partners will truly highlight the cultural heritage and diversity of this destination? What kind of help (if any) does the local community need? How can we help? What restaurants in this destination source their produce from local farmers? Does this partner treat the wildlife or animals it interacts with responsibly? On our Mysteries of India tour, we make lunch more meaningful with a visit to Sheroes Hangout, a café that’s run entirely by women who are survivors of heinous acid attacks. On the Switzerland: Hidden Trails & Majestic Peaks tour, we travel entirely by train via The Swiss Rail Service. Train travel is a great way to reduce your carbon footprint. You trust us to make the right decisions in who we partner with and we take that trust seriously. We try to work with vendors who are doing their best to make the world a better place. Learn more about a few of these vendors below. On our From the Outback to the Glaciers tour, guests visit the Phillip Island Penguin Reserve in Phillip Island, Australia and can “adopt a penguin” to support penguin conservation while admiring these creatures in their natural habitat. On our Exploring South Africa, Victoria Falls & Botswana tour, we partner with Wild Horizons, a local tour operator that promotes conservation and educates and empowers indigenous communities while using resources sustainably. On our Norwegian Coastal Voyage tour, we partner with Hurtigruten Cruises. They support the Norwegian economy by providing jobs to locals, using eco-friendly Marine Gas Oil and raising money for the unique habitats they visit. On our America’s Cowboy Country tour, we visit Custer State Park in South Dakota. The South Dakota State Park system preserves and restores rare and non-game animal and plant species. Tourism Cares, a 501(c)(3) nonprofit unites the travel and tourism industry to benefit the people and places our industry depends on. Collette’s employees have taken part in several Tourism Cares projects around the U.S. helping out communities in need. We’re continually auditing our tours to ensure they meet our responsible travel standards while seeking out ways to create a positive impact. We love introducing guests to fascinating new destinations while being mindful of the impact over-tourism can have. That’s why we’re always thinking of ways to use smarter, less-traveled tour routes, listening to what locals in these destinations have to say about their community’s needs, and encourage visiting popular destinations during their off-season. 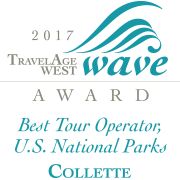 At Collette, we believe that travel and tourism can be a force for good. Check out a few travel guides so that you can start to immerse yourself in the destination. Research appropriate dress to ensure you’re packing acceptable attire. Learn some common phrases in the local language to better connect with locals. Learn more about the culture of the destination to gain a better understanding of its customs and traditions. During your travels, take opportunities to help preserve local communities and the environment so that you can make a positive impact. Use water sparingly and bring a refillable water bottle. Reuse items when possible, like towels or linens. Switch off appliances and unplug them when not in use. Never purchase products made using endangered plants, animals and other threatened natural resources. Access places only open to visitors. Follow designated trails, respect caretakers, and do not remove archaeological or biological objects from sites. Spread economic benefits and buy local. Avoid excessive bargaining. Always ask before taking photographs. After your travels, stay connected to your trip after you return home. Travel is inspiring and opens our own worlds so much. Give back. If you were inspired by your trip, look for programs and organizations that are doing good work in the places you visited. Share. Tell others about the things you did and the people you met on your journey. Get the message out on social media to encourage others to visit the destination to fulfill the goals for economic and social sustainability.